Pyrrhuras are endemic to tropical and subtropical South America and southern Central America (Panama and Costa Rica), where they can be found in the humid forest and adjacent habitats. In the wild, they typically move around in small, noisy flocks, flying swiftly at or below canopy level. Once settled in a tree they tend to be silent (especially if they sense danger) and difficult to spot. They nest in tree-crevices. Some species are highly endangered. Pyrrhuras have long, pointed tails and a relatively narrow, dark greyish to white eye-ring. Many have scaly or barred chest-patterns and whitish, pale grey, buff or reddish ear-patches. Under the right conditions, Pyrrhuras can be very prolific breeders. Prices range from $125 for many members of the Pyrrhura genus to $700 or more for larger and rarer genus members. Hellmayr's Parakeet (Pyrrhura amazonum) - traditionally a subspecies of P. picta. Santa Marta Parakeet, Pyrrhura viridicata. El Oro Parakeet, Pyrrhura orcesi. Black-capped (Rock) Parakeet, Pyrrhura rupicola. Flame-winged (Brown-breasted) Parakeet, Pyrrhura calliptera. Rose-headed (Rose-crowned) Parakeet, Pyrrhura rhodocephala. 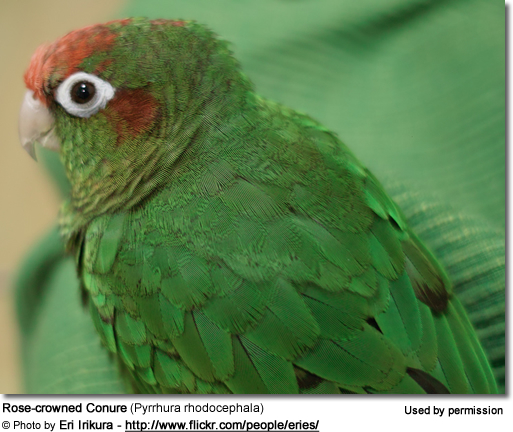 Brown-breasted Conures: Please scroll up for additional information. 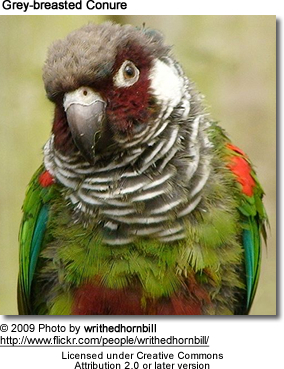 El Oro Conures: Please scroll up for additional information.